The Aventra trains, which will be supplied in both five- and ten-car configurations, will operate on the Reading, Windsor and West London suburban routes. Steve Montgomery, managing director of First Rail, said: “We have exciting plans for the South Western rail franchise and these new trains are an important step on the way to delivering an improved journey experience for our passengers. The South Western Franchise transers to First Group / MTR from the 27th August 2017. The new franchise will run for 7 years from 20 August 2017 to 18 August 2024, with an extension of 11 railway periods callable DoT discretion. First MTR South Western Trains Limited will oversee a £1.2 billion investment programme to improve services for passengers on all parts of the network from London to the South West. There will be 22,000 extra seats into London Waterloo each morning peak and 30,000 extra seats out of Waterloo each evening peak, and a fleet of 90 new trains will provide more space for passengers on Reading, Windsor and London routes. According to Wikipedia, these new Aventra trains will be replacing the old 455 and 456 units, and the non-standard 458s. And yes controversially, they are also seen as replacements to the 707's that have not even started to enter service yet! Although this new train order does not effect us down here in the far south west, it does prove First/MTR have major plans for the SWT fleet. Considering First already spot-hire DMUs from SWT on nearly a weekly basis, it seems probable that they might start reallocating some DMUs between the two franchises. The 707s are also a non-standard train - 150 vehicles represents 30 train sets. There is a big advantage to First/MTR in having a unified, standard fleet. Also the idea that they will be "scrapped" before they have even entered service is ludicrous. They WILL enter service with SWT and will be used until the last Aventras have arrived to replace them. 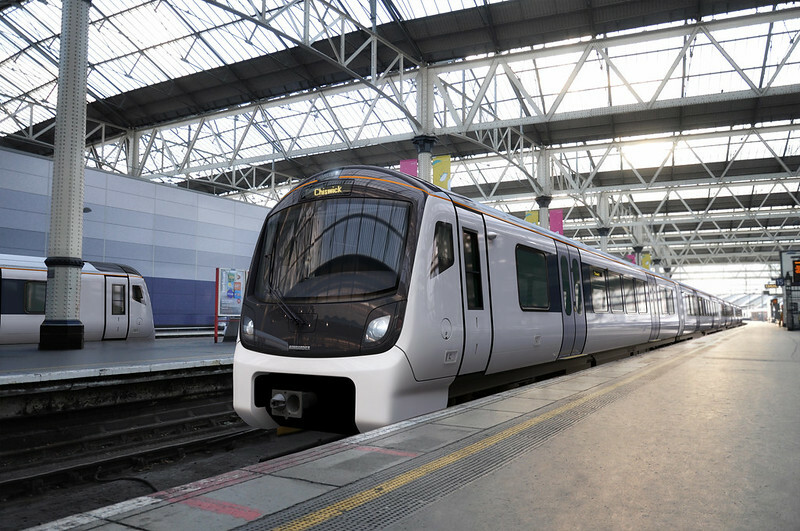 Given that the 707s have a family resemblance to the class 700s operated by Govia Thameslink, and also given that commuting into London is forecast to rise relentlessly, with people moving ever further out of the city to find affordable housing, I venture that those 30 units will not be unemployed for long. Indeed it could even be that increasing passenger numbers require SWT to hold on to them anyway! I tried the new 700's on the Thameslink from East Croydon across London & while the acceleration is impressive the seats are so hard & thin that my legs were hurting after only a few minutes.Are they really a solution for Brighton to Bedford or Waterloo to Reading? DFT apparently did the specs. Even the old 455's have a much better comfort level. First/MTR have made the right call. Honestly when I heard about these new trains I was annoyed, I thought they would be replacing nice new trains which look really nice with some type of other horrid train, but if they look anything like the picture these will be very nice trains, topping the Desiro for me! Whilst morally I don't believe in these trains, they do look very nice and I am sure of several things: some company, somewhere, will eventually take at least a few of the old new trains (looking at c2c, London Midland and Arriva Trains Wales as the most likely to take them, possibly Scotrail too.